USB sticks have long since ceased to be as boring as they were a few years ago. They are now available in all kinds of designs and finishes, so that they can often be used as funny gift ideas or eye-catchers in the office. The superhero USB sticks, which are available in Chinese shops in countless different designs and sizes, also fulfil this purpose. 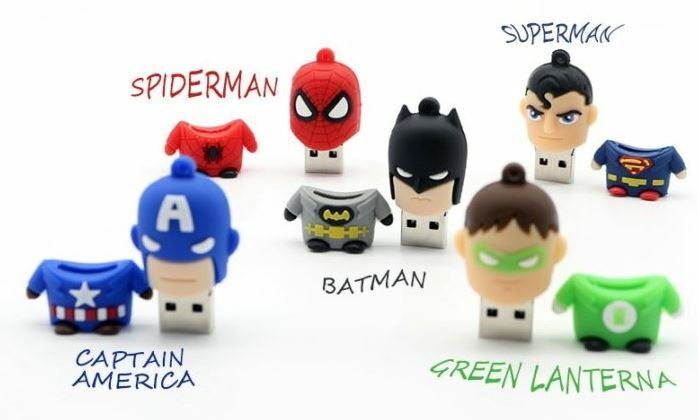 The superheroe USB sticks are always built according to the same model: The head is removable and the USB stick is located at the bottom of the head. Once you’ve started to search the China shops for the cult USB sticks, you can’t even decide on a superhero. Especially on AliExpress you will find countless different heroes in different qualities and memory sizes. So if your superhero is not available in the linked shop, you can search for your favourite hero yourself here. Which superhero USB stick would you most likely trust with your data?